“Unstoppable” will never be mistaken for anything other than a Hollywood blockbuster because it’s the sort of big, in-your-face entertainment that helped define the genre. The characters are archetypes, the dialogue designed to make viewers hiss and cheer and the action sequences accented by massive explosions. It’s also a lot of fun. The story centers on a railway veteran named Frank (Denzel Washington) and a young trainee named Will (Chris Pine). They are spending their first day together and the tension is palpable because the railroad has been laying off older workers and replacing them with younger, cheaper labor, like Will. Still, they go about their duties professionally, Frank taking pleasure in letting Will know whenever he makes a mistake. Then, the unthinkable happens. The two men learn that there’s a runaway train barreling toward them under full power. Even worse, the train is loaded with enough toxic cargo to take out an entire town. With little time to react, Frank and Will find themselves scrambling to save their own necks and devise a way to stop the unmanned vehicle. Washington is one of the greatest actors of his generation, and he’s perfect in the role of an aging guy who knows his job inside and out. Pine – who played James Kirk in the recent “Star Trek” reboot – is just getting his career off the ground, but he has a nice screen presence and makes a decent foil for Washington. 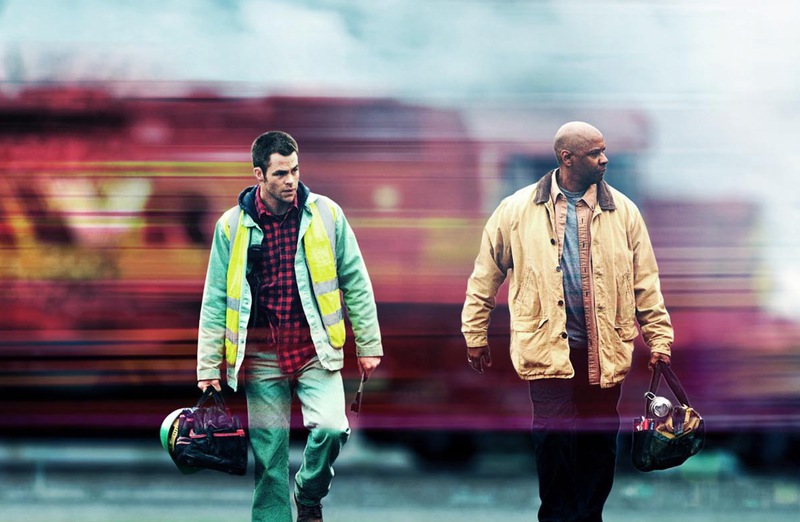 “Unstoppable” may not be the smartest film on the block, but it is well paced and exciting, and we shouldn’t expect anything less from Tony Scott. DVD and Blu-ray extras include a bit on the development of the script and an audio commentary by Scott. In 2006, director Davis Guggenheim’s “An Inconvenient Truth” called attention to one of the biggest threats facing our planet: global warming. With “Waiting for Superman,” he narrows his scope, focusing only on America. “Waiting for Superman” is an important movie if only because it calls attention to a problem with the potential to unravel America’s global standing. To underscore this point, the film contains footage of tech entrepreneur and philanthropist Bill Gates arguing that innovation is impossible without quality education. People who follow the news know Gates is right, as other nations have already surpassed us in many key fields. “Superman” does have its flaws, however, the most important being that it presents an oversimplified solution to our education problem. Guggenheim focuses on a few select charter schools that have had success operating in impoverished areas. He asserts that these schools should be our models and notes that the main differences between them and our public institutions are longer school days and the presence of excellent educators at all levels. He also makes teacher’s unions the villain in the film, asserting that they have made it virtually impossible to fire bad educators. While most people would agree that we need to develop a system where great teachers are rewarded and poor ones fired, placing the blame squarely on the shoulders of educators ignores the fact that parents also play a role in all of this. “Waiting for Superman” explains that students who grow up in moneyed families have a greater degree of success than those who are poor, and the film seems to argue that public schools in poor areas are worse than others. Guggenheim does not, however, address the fact that wealthier – and more educated – parents are often more involved in their children’s educations. Also, the charter schools that he uses as models are so popular that students must win lotteries to attend them. Because of this, they are assured of students with involved parents. It seems unfair to compare the average public school to a charter facility populated only by students whose parents are highly invested in their educations. The fact that Guggenheim’s film is such a surface-level examination of a complex problem may explain why it wasn’t nominated for an Academy Award for best documentary. Still, it at least gives a voice to a major problem that should receive more attention than it does. The home video release of “Waiting for Superman” is remarkable because every DVD and Blu-ray comes with a $25 gift card allowing buyers to make a donation to the classroom project of their choice at DonorsChoose.org. Extra features on both the DVD and Blu-ray releases include a bit updating changes in education since the film was made, a short on the challenges that students and teachers in the public school system face, a collection of deleted scenes, an interview with Guggenheim, and an audio commentary by Guggenheim and producer Lesley Chilcott. Writer-director Woody Allen’s “You Will Meet a Tall Dark Stranger” begins with a nameless narrator reminding viewers that “Shakespeare said life was full of sound and fury and in the end signified nothing.” It then goes on to tell a brassy, furious tale loaded with meaning … but only for those who choose to extract it. The action centers on a series of interrelated characters at a crossroads in their lives. First, there’s Alfie Shebritch (Anthony Hopkins), a senior who discovers a sudden determination to best Father Time with a quick divorce and nonstop workouts. This leaves his long-time wife, Helena (Gemma Jones), in despair, so she turns to a psychic (Pauline Collins). In the meantime, their daughter, Sally (Naomi Watts), is frustrated by the fact that her novelist husband, Roy (Josh Brolin), can’t knock out his second book. It’s enough to make her look twice at her handsome boss (Antonio Banderas) who is facing marital difficulties of his own. Roy is also frustrated, but he finds a muse in a beautiful guitar player (Freida Pinto) who moves in across the street. Allen’s film is about characters who are dissatisfied with life and determined to make improvements, even if their plans are questionable. It’s the sort of setup that Shakespeare would have loved – sound and fury, you know – and Allen allows it to play out in entertaining and thoughtful fashion. The director has always had a knack for assembling superb casts, and the group he’s gathered here is no exception. The acting firepower does not, however, diminish the quality of Allen’s story. A lot goes on during the course of “You Will Meet a Tall Dark Stranger,” yet few things are resolved by the time it ends. The fact that most plot threads are left dangling is frustrating, but Allen clearly did this on purpose. Remember that allusion to Shakespeare. Our lives are filled with bustle and noise, but what they mean in the end is open to interpretation … just like Allen’s film. Home video extras are minimal. In fact, the DVD release has nothing more than a trailer for the film and advertisement for the soundtrack. “Glorious 39”: Conspiracy thriller set in the days leading up to World War II. Romola Garai stars as a young English actress who finds evidence that may lead to a frightening Nazi plot. Bill Nighy, Julie Christie, David Tennant and Christopher Lee also star. Written and directed by Stephen Poliakoff. “William S. Burroughs – A Man Within”: Documentary about Burroughs, a major literary figure of the Beat Generation. The movie was produced, written and directed by Yony Leyser. “Chaplin” – 15th Anniversary Blu-ray: The 1992 drama featuring Robert Downey Jr. as legendary film star Charlie Chaplin is finally arriving on high-definition Blu-ray. The movie was directed by two-time Oscar winner Richard Attenborough. “Stag Night”: Horror film about four guys who set out for a good time, but get trapped in a deserted underground train station where they’re hunted by cannibals. Released as part of Lionsgate’s Ghost House Underground series. Kip Pardue, Vinessa Shaw and Breckin Meyer star. “National Lampoon’s Dirty Movie”: Direct-to-video comedy from the folks at National Lampoon. The story follows a low-rent movie producer’s efforts to write and make a film based around the filthiest jokes ever told. Directed by Jerry Daigle. “The Last Lovecraft – Relic of Cthulhu”: Science-fiction comedy about a regular guy (Kyle Davis) who learns that he’s the last living relative of horror writer H.P. Lovecraft and must protect an ancient relic from falling into the wrong hands. Directed by Henry Saine. “Doctor Who – A Christmas Carol”: This hour-long holiday episode of the popular sci-fi TV show “Dr. Who” first aired on Christmas Day 2010. The story sends the time-travelling title character on a mission to save a lonely miser’s soul. “A Kiss of Chaos”: Crime thriller about an artist (Judy Marte) whose life unravels when her injured boyfriend and HIV-positive sister show up at her door unexpectedly. Manny Perez and Adam Rodriguez also star. Written and directed by Ricardo Sean Thompson. Just watched Waiting for Superman and found it amazing, depressing and encouraging all at once. As a life-long homeschool (and other alternative education) advocate I believe that each child deserves to a quality education. They certainly deserve better than the drop out schools and the lemon teachers. I went to one of the top 7% public schools in the country and yet I certainly had my share of lemons. Particularly my math teachers were terrible and guess what I hate math. Its not just the lemons but the good teachers getting no real profit from their excellence. In fact, most of the good teachers are thwarted by restrictions and regulations. Its nuts. The only thing the movie didn’t mention was the moral corruptness within public schools. If I had children I would not want them forced to learn about alternative lifestyles and families. I want my children to know about such things and to respect and love all people but I want them to learn about it from me. I understand why they didn’t address this in the movie but it would be a concern for me if I had children going to public school. Anyway, a great documentary. I wish all American’s could watch it. It broke my heart when the kids didn’t get the lottery- especially Daisy. I wish I could help her. Alwasy nice to hear from you and, on a personal note, hope your surgery went well. As mentioned, I think “Superman” brings up some very important issues. I still wish, however, that it would have had more substance in some areas. For instance, it seems to argue that charter schools are the solution to all our problems when, in reality, there are good charter schools … and bad ones. Personally, I would like to see us fix the public school system, not abandon it. My wife is an educator and I’m the first one to say that we need to have better systems in place to retain and reward good teachers and to remove those who are no longer doing a good job. That said, I’m not sure what the solution is … but we certainly need more people talking about it. That’s true. Charter schools aren’t the only solution. I couldn’t believe the scene where the chancellor is willing to pay good teachers 6 figure salaries just so she can discipline the bad ones and the union wouldn’t even vote on it. That’s crazy. Its such a complicated problem but I hope that people are continuing to try new things instead of just throwing money and legislation at it. I would personally want to homeschool my kids but that’s just me. I recognize that is not an option for most families. My surgery went well. Still have some pain and soreness but I’m progressing well. Thanks. Hopefully, people do keep working on the education issue. Anything like this gets complicated because so many people and viewpoints are involved. That’s probably why some charter schools do thrive. If you have the right people running them, the lessening of the red tape is a good thing.